You can successfully breastfeed your baby if the milk supply is good. Low milk supply might leave the baby hungry, making you to opt for formula. And when your breastmilk supply is low, the experienced mothers around you come up with some remedies. They might ask you to consume some foods, and keep away from some. Fennel seeds figure prominently in the to-have list as they are regarded a galactagogue, a compound that promotes lactation. But what are the facts? MomJunction tells you the truth and gives information on the affect of fennel on an infant’s health. Fennel seed is sourced from the Foeniculum vulgare plant and is a favorite herb used in several cuisines throughout the world. In India, it is called saunf, and is often consumed raw after meals for healthy digestion. Powdered fennel is used as food flavoring. Fennel oil is added to tea for flavor, or fennels seeds are directly infused in water with other herbs to make herbal tea. Let’s see if fennel helps in breastmilk supply. Does Fennel Increase Milk Supply? Yes, fennel seeds can increase the quantity of breastmilk but it is anecdotal, and lacks scientific evidence in humans. However, researchers acknowledge galactagogue properties of fennel as studies have found a significant increase in milk production among other mammals (1). Read on to know how fennel works in humans. According to the book Bhavaprakashaof Bhavamishra Commentary by Dr. Bulusu Sitaram, ayurveda recognizes fennel, along with dill seeds, as a galactagogue. They are also known to relieve pain in the female genital organs and the spasmodic pain of abdominal organs, and act as appetizers and taste promoters. How Does Fennel Increase Breastmilk? Fennel contains a compound called anethole, which is chemically similar to the brain’s neurotransmitter dopamine. Dopamine binds to prolactin, the hormone that stimulates the production of breastmilk and changes its chemical composition, making it ineffective in milk production. Since anethole is identical, it competes with dopamine and binds with prolactin first, but preserves its milk stimulation properties. Therefore, there is a boost in the milk production due to drop in ineffective prolactin-dopamine compound (2). You might want to know the quantity of fennel to consume to make it effective. How Much Fennel Helps Increase The Milk Supply? After a careful analysis of about 32 studies on galactagogues, researchers have found the results ambiguous. The scientists concluded that the use of fennel and other galactagogues is inconclusive and subject to more research (3). So, there is no means of telling how much fennel can increase breastmilk and by what quantity (4). How To Consume Fennel When Breastfeeding? 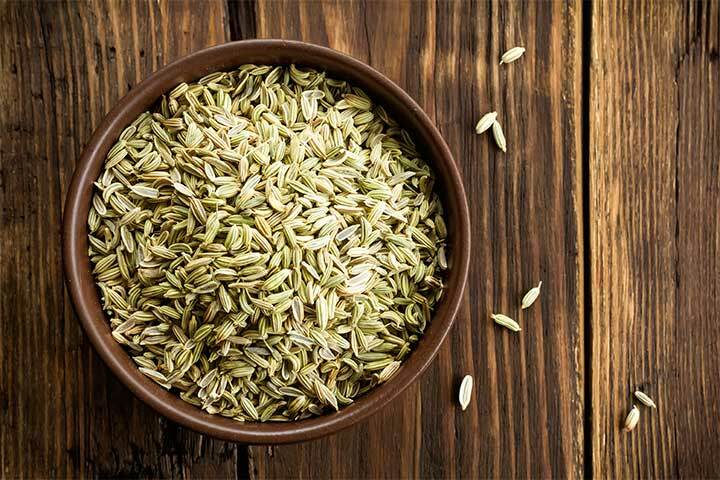 If you consume a traditional Indian mouth freshener after meals, then you are quite probably having raw fennel seeds already. Since mouth fresheners are consumed in small quantities, you will ingest only a small amount of fennel this way. Fennel tea is a decoction of fennel seeds, leaves, and even the root bulb boiled together in water. The tea is naturally free of caffeine and helps in digestion. Fennel oil is made from crushing the fennel seeds to extract anethole-rich oil from it. Fennel essential oil can be added to regular tea or a glass of warm water. Do note that just like any other essential oil, fennel oil contains compounds in their concentrated quantities – beyond what you consume through raw seeds or tea. Therefore, stick to the suggested quantity of consumption mentioned on the bottle or consult a doctor/lactation expert before using it. Fennel extract tablets and capsules contain crushed fennel seeds encapsulated in gelatin. They are often consumed after meals to help ease after-meal bloating. But, just as fennel oil, the contents in capsules and tablets are in a concentrated form. Fennel belongs to the same botanical family as carrot. Therefore, fennel’s root leaves can be eaten. Fennel powder has been used in food preparation for centuries. Powdered fennel is available in supermarkets, and you can add it to any dish for flavor while also getting the natural benefits of fennel. Fennel preparations like oil and capsules may contain preservatives that could harm the baby, and it is best to avoid them or consult a doctor before using them. Are There Any Side Effects Of Fennel When Breastfeeding? No, there are no side effects of fennel consumption either on the mother or the baby’s health (1). It has GRAS (Generally Regarded As Safe) status in the US. No study has directly pointed to any complication or problem arising out of having fennel when breastfeeding (7). It means it is up to the mother’s discretion to consume it (8). Nevertheless, you can consult a lactation expert before consuming fennel to ensure that you rule out all possible side-effects. Several hospitals and medical centers recommend expectant and lactating mothers to avoid fennel under certain circumstances (9). A history of gynecological problems or cancer: If you have had uterine complications or cancer of ovary/breast in the past, then you must avoid fennel. Fennel contains a few compounds that mimic the female hormone estrogen. An additional dose of estrogen may cause new complications (10) (11). Mother or baby has food allergy: Usually, mothers who are allergic to carrot, celery, and coriander may have a fennel allergy too as these plants belong to the same family. A mother may be aware of her allergies and can avoid fennel. But it is not known whether the baby can develop an allergy to fennel through breastmilk. However, researchers state that fennel is least likely to cause any adverse effects on the infant (12). Watch out for any symptoms of allergy when you breastfeed the infant for the first time after having fennel. A baby with an allergy towards fennel will develop skin hives, abdominal pain, vomiting, and diarrhea, swollen face, and shortness of breath. The infant would also seem lethargic. Research has shown that fennel allergy is rare and thus it is quite unlikely to cause any complications to the breastfeeding baby (13). Nevertheless, take your baby to the doctor right away if you suspect an allergy. Besides working towards increasing breastmilk in babies, fennel comes packed with many other benefits. Are There Any Other Health Benefits Of Fennel? Yes, the health benefits of fennel are in plenty. Fennel aids digestion. It is also scientifically acclaimed to relieve indigestion and alleviate the formation of gas in the digestive system (14). Researchers have found that regular consumption of fennel tea can help lower blood pressure in patients (15). The fennel root, called fennel bulb, is an excellent source of dietary fiber and vitamins A, C, and K (16), and potassium (17). Fennel oil contains several antioxidants that have an anticarcinogenic effect on cells. These properties help shield a person from premature aging and also mitigate the chances of cancer including breast cancer (18). Laboratory research has shown that fennel reduces the intensity and side effects of polycystic ovary syndrome (PCOS), a condition where the ovaries enlarge with the formation of cysts. Researchers have noted that fennel could be helpful in other gynecological problems as well (19). People have consumed fennel for centuries, and it is an excellent addition to one’s diet. However, consumption of any substance in excess can cause fussiness in nursing infants, and fennel is no exception. Therefore, moderation is the key. Fennel is an herb and should be used as one. That means having two to three tiny servings per day as a mouth freshener, tea, or in a dish will certainly have no adverse effects and will let your baby grow healthy and strong.